Do you work with senior citizens 55+ in the Golden Triangle? Don’t miss the Jasper Senior Services Mixer. The popular Southeast Texas networking event series has beenn held at locations across the Golden Triangle: Beaumont, Port Arthur, Silsbee, and Jasper. This is the second time the event has come to Jasper in 2017. The object is to help companies, medical practices, churches, and nonprofit organizations from across Southeast Texas meet their potential referral partners and to start a relationship. Savvy networkers then schedule follow up lunches and coffee meetings to start the process of passing referrals. Does your business rely on referrals for new senior clients? Click here for the Jasper Senior Services Mixer Facebook Event Page. We look forward to helping you network with other local senior service providers. 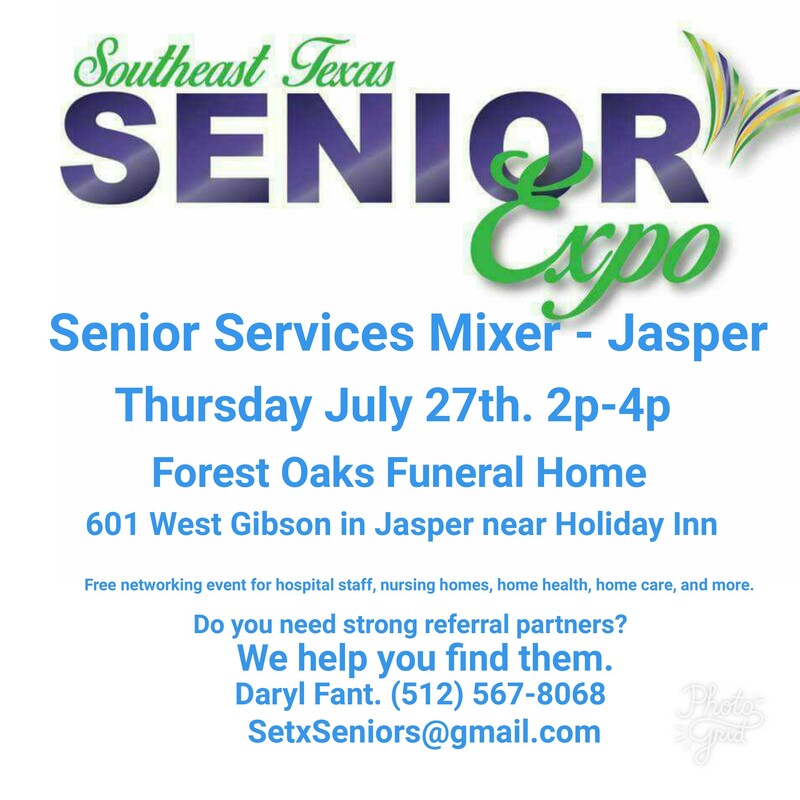 Do you have questions about the Jasper Senior Services Mixer or about our upcoming Southeast Texas Senior Expo Series events? If you work with seniors in the Jasper area, you will want to make sure to register as a vendor for the Jasper Senior Expo. You can find strong referral partners in the Golden Triangle. The Southeast Texas Senior Services Mixer series of networking events can help. We’ll see you Thursday at the Jasper Senior Services Mixer. Do you serve the entire Golden Triangle? Click here to register as a vendor for the Port Arthur Senior Expo and / or Jasper Senior Expo. You can effectively market to seniors.